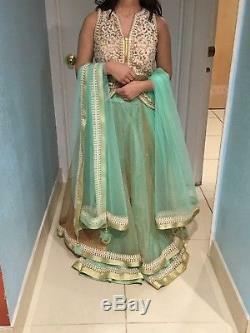 Beautiful mint green two piece indian outfit. Perfect for weddings and other formal events. The model in the picture is 4'11'' and 100 pounds. The measurements of the outfit are listed below.... Chest- 30 (can be adjusted to 34, there are extra margins inside the blouse to make bigger). Skirt Waist - 26 inches. The item "Two Piece LONG Gherdaar Anarkali Gown Indian Wedding, partyDress Hand Embroidery" is in sale since Thursday, December 21, 2017. This item is in the category "Clothing, Shoes & Accessories\World & Traditional Clothing\India & Pakistan\Salwar Kameez". The seller is "spat3534" and is located in Jackson, Mississippi. This item can be shipped to United States.